For Harry Griffin '18, relationships have fueled his pursuits. Whether it was mentors who helped give him the confidence to move from Alabama to Minnesota, or connections with teammates and students that helped him feel at home in Duluth, Griffin has been graced with positive influences. His high school football offensive line coach, William Moguel, and family friend Doug Martin were instrumental in his personal growth. "I was lucky enough to have great role models who pointed me in the right direction, and helped me shape priorities," Griffin said. "They both thought going up north to Duluth would be a great chance to see different places and experience life outside Alabama." Griffin sought to be the same kind of leader in a role he took on during his senior year: assistant offensive line coach for St. Scholastica. "I want to reach out to young men in various communities and be that positive influence for them," said Griffin, a double-major in psychology and education studies. "Plus, I absolutely love sports — from football to basketball and baseball, they've been a part of my life since I was five years old." Since graduating in spring of 2018, he still aims to serve as a good example for athletes and students alike. 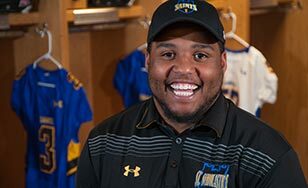 He is now a resident director for Residential Life at St. Scholastica, and defensive intern with the football team. "I decided to stay in Minnesota because of the variety of job opportunities that are available throughout the state," he said. "Minnesota is also a great place to live because of the amazing nature and the outdoor scenes that the state has to offer." While being far from family and friends wasn't easy for Griffin, his resolve would be truly tested on the football field. After a difficult freshman season, coaches asked if he would consider a move from the defensive line to the offensive line. The coaching staff and Griffin's Saints teammates made it a smooth transition. "The coaches were there for me through everything — they took it slow with learning plays and the offensive system, and they were always encouraging me and keeping me upbeat," Griffin said. The players, coaches and training staff also offered their full support to Griffin as he recovered from a broken ankle. He went on to play a key role on winning teams throughout his career. "The training staff was amazing in getting me back to 100 percent." Griffin called out a specific teammate who was an incredible encouragement. "This whole team is a brotherhood, but Sherome Milon, my senior mentor during freshman year, was always looking out for me and making sure I was on top of my studies and feeling comfortable with what was happening on the field," Griffin said. Griffin has also been active in helping bridge people of different races, a skill that has served him well in a coaching role. He's held leadership positions in the Black Student Union, and has been an advocate for the Latino Student Union and Asian Student Union on campus. Each organization is built to raise cultural awareness and promote positive interactions between people with varying backgrounds. "As vice president of the Black Student Union, I was responsible for fundraisers and helping plan and execute events," Griffin said. "One event we put on was a concert where we were able to provide a venue for local hip-hop artists to perform. It was a great opportunity to create a positive atmosphere." Learn more about Harry’s journey from Elba, Alabama to Duluth, as featured on the CSS football program Inside The Huddle.